After making the first batch of Chocolate Nutella Fudge with Sea Salt last year, my family (kids, grandparents and brother-in-law included) immediately determined it was a must-have for each Christmas, to be served alongside my husband’s great-grandmother’s spritz butter cookies and my dad’s killer ginger cookies. Yeah, okay…twist my arm. That fudge set off a cascade of gooey chocolate and hazelnut baking in our house, from Chewy Nutella & Oatmeal Bars to Nutella & Cream Cheese Swirled Blondies. It was only a matter of time before the Nutella weaseled its way into the center of my favorite sugar cookie recipe (typically made with crumbled Heath Bars). When making drop cookies, I like to be fairly precise about the size of each cookie so that they cook as evenly as possible. No loosey-goosey dropping from a spoon in this elf’s kitchen. For years, I have used cookie scoops, such as the OXO ones you see in the photos below, to dole out an equal amount of batter. It makes the process of doling out the dough go quickly and the scoops are fun for little hands to use, too. You can use the small scoops for bite-sized cookies, medium scoops for your average sized treats and large scoops for those gargantuan cookies like what you may see in your favorite bakery. Of course, if you decide to make bite-sized cookies, that means you get to eat a minimum of three cookies. Santa’s rule. I swear on Rudolph’s shiny red nose. It’s a good thing this rule exists because it is virtually impossible to eat only one of these cookies. For details on entering the OXO baking giveaway, scroll down. You don’t want to miss it. Again…on Rudolph’s shiny red nose. 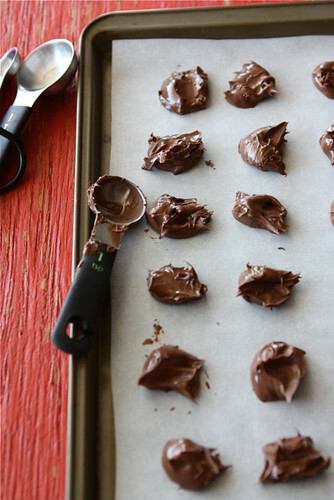 Using a 1 teaspoon measure, scoop out Nutella and place in small mounds on a cookie sheet lined with parchment paper. Place in the freezer for 15 minutes. Place an oven rack in the middle position and preheat the oven to 350 degrees F. Line 2 large baking sheets with parchment paper. In a large bowl, beat butter and sugar with an electric mixer set on medium speed until the mixture is creamy and fluffy, 3 to 5 minutes. Beat in eggs, one at a time, and vanilla extract. 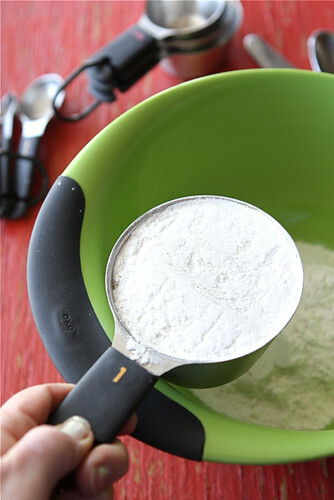 Turn the mixer to low speed and gradually beat in the flour mixture until it is just combined. Using a rubber spatula, stir the mixture a few times to make sure all of the flour mixture is incorporated. Place 1/3 cup granulated sugar in a small bowl. Use 2 tablespoons cookie dough for each cookie. Split the piece of dough in half and slightly flatten the bottom half. Sprinkle 5 or 6 grains of sea salt on the dough. Use a small metal spatula to lift the mounds of Nutella from the baking sheet and lay on the bottom half of cookie dough, on top of the salt. If the Nutella starts to soften, place back in the freezer for a few minutes. Cover with the other piece of cookie dough. Seal the edges with your fingers. Roll the ball in the sugar to coat it and place it on a prepared baking sheet. Bake the cookies, one sheet a time, rotating from front to back halfway through baking. They are done when the edges are set and beginning to brown, 10 to 13 minutes. The centers of the cookies should still be soft and puffy. Remove the cookies from the oven and let them cool on the baking sheet for 10 minutes. Using a spatula, remove the cookies from the baking sheet and let cool on a rack. Serve. 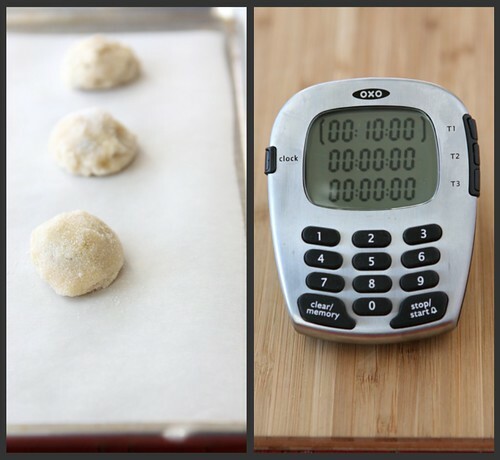 Yields Makes approximately 24 cookies. In a large bowl, beat butter and 1½ cups granulated sugar with an electric mixer set on medium speed until the mixture is creamy and fluffy, 3 to 5 minutes. Beat in the eggs, one at a time, and the vanilla extract. Place ⅓ cup granulated sugar in a small bowl. Use 2 tablespoons cookie dough for each cookie. Split the piece of dough in half and slightly flatten the bottom half. Sprinkle 5 or 6 grains of sea salt on the flattened dough. Use a small metal spatula to lift the mounds of Nutella from the baking sheet and lay on the bottom half of cookie dough, on top of the salt. If the Nutella starts to soften, place back in the freezer for a few minutes. Cover Nutella with the other piece of cookie dough. Seal the edges with your fingers. Roll the ball in the sugar to coat it and place it on a prepared baking sheet. Bake the cookies, one sheet a time, rotating from front to back halfway through baking. They are done when the edges are set and beginning to brown, 10 to 13 minutes. The centers of the cookies should still be soft and puffy. Remove the cookies from the oven and let them cool on the baking sheet for 10 minutes. Using a spatula, remove the cookies from the baking sheet and let cool on a rack. They can also be served warm. Disclosure: This post is sponsored by OXO and they provided me with OXO products for my personal use and the giveaway. As usual my opinions are my own and, let me tell you, I adore OXO products. These cookies are lovely and this giveaway is awesome! This could be a new favorite for me! Happy Holidays Dara thanks! What a yummy looking cookie and the giveaway is awesome for sure. Thanks so much. Looks amazing, can’t wait to try this! I like both Oxo and Cookin Canuck and Follow too. These look great, can’t wait to make some cookies! Sounds delicious. Who doesn’t love Nutella. I also follow on you on twitter. I was at a friend’s home for a Church meeting with several women,the host brought out this jar of Nutella and was raving about the taste.Of course we all had to have a small taste. I am hooked and I have been wanting to try it in recipes thank you for this one .Looking forward to more. And I like Cookin’ Canuck on Facebook. like you on facebook ! Sorry did not leave my email in first comment. I’ve yet to try a stuffed cookie and Nutella is the place to start! These look so delicious. I follow Cookin Canuck on twitter. i have always wanted recipes for nutella!!!! These look great! How could they not be with such a yummy filing? Love your site! This giveaway is perfect for avid cookie bakers 🙂 Love it!! I love stuffed cookies. It’s a little surprise inside! I’ve done this before and can attest to it’s deliciousness! Not open to Canucks? I’m disappointed, Dara! Erica, thanks for the heads-up about the sea salt. It’s a “must” in this recipe. I adjusted the ingredients list and instructions. As for opening up the giveaway Canadians – well, I really wish I could. Unfortunately, some U.S. companies are bound by agreements that they have with distributors in other countries which stops them from being able to ship the products to winners outside of the U.S. I’m sorry! Cookie scoops are on my Christmas list this year. These cookies look amazing! I would love to win this. I love…..to bake! Those look so yummy! Thanks for sharing on of your family favorites! I love OXO! I registered for a ton of it for my wedding this April! Also…I love Nutella! and cookies! Cookin’ Canuck, its like you know me lol! Love nutella and am always looking for other ways to use it in recipes and cooking! I may make these cookies for my cookie exchange. I ‘like’d OXO on Facebook! I ‘like’d Cookin’ Canuck on Facebook! Wow, amazing recipe. Thanks for this! I “like” OXO on Facebook. Thanx for the chance. oooOOOooo…you’re a genius! 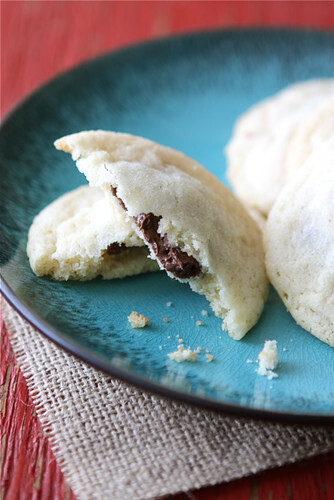 Sugar cookies stuffed with Nutella? I’m going to swoon…right after I make some! Thanks for the recipe and for the giveaway, too! What a lovely blog..I am a huge Nutella fan and OXO fan ..they have the best utensils fo r folks like me with bone issues..so easy to use..Glad I found you.. I followed OXO on Twitter @AsTheNight. I followed cookincanuck on Twitter @AsTheNight. I shared on Twitter: http://twitter.com/#!/AsTheNight/status/146643381257383936. I already like OXO on Facebook (that’s where I heard about this recipe). I LOVE these & plan to make a gluten free batch for ME!! The kids can eat the regular version so I will probably only make a half batch for momma! OMGosh, Nutella & OXO heaven combined! Thank you for sharing this recipe. I truly appreciate it even if I don’t win the contest. <3 & happy baking to you! yummy – those cookies look delicious 🙂 Happy Holidays! I liked Cookin’ Canuck on Facebook. Wow, that looks amazing! I have had bad luck with the scoop I bought…which broke after two uses (!). It wasn’t OXO, though. How fun! Would love this set for Christmas! I shared on Facebook: http://www.facebook.com/cookincanuck?ref=ts&sk=wall#!/permalink.php?story_fbid=336776493003757&id=662760126. What a great collection of goodies!!! Thanks for the chance to win. These look absolutely delicious. I’m always looking for new ways to use Nutella! Like Cookin Canuck on Facebook. Looks amazing! Can’t wait to try this out. And now I follow you on twitter too! These cookies AND the giveaway both look awesome! and I posted a link to this entry on my Floptimism FB page (http://www.facebook.com/pages/Floptimism/129258673821099?ref=tn_tnmn). Plus I also follow you on Twitter (via Floptimism)! Would love to win for the cookie scoops! I always drool over them but never used them. Those cookies look great! I’m obsessed with sweet and salty stuff! I like Cookin Canuck on Facebook. Love those cookie scoops. We seem to do the 2 teaspoon thing which makes unequal cookies. PS – Never had nutella in a cookie until last week when I got a batch in a cookie swap. Love! Yours look great. Definitely going to try these for my sons when they are home from University. Thanks! Love Nutella and I’m always looking for new ways to use it however dangerous they may be! These cookies look awesome. I love how you made little pucks of the nutella. Anything with Nutella……I’m all over it!! thanks for the recipe and a fab giveaway Dara! Adding Nutella to my shopping list! Those look wonderful. Thanks for a super giveaway, OXO makes the best kitchen tools!! I love OXO !!! Follow ur website. OH my YUMMY! What a GREAT IDEA, Dara!!! That is one incredible giveaway and those cookies look delectable too. This looks like a delicious cookie and I know my family would love it. Great giveaway. Your pictures are perfect! Come visit us. We have a wonderful Kahula cocoa and today a giveaway just in time for Christmas. A wonderful autographed book. Great present. Be sure to register to win. YUM! I have to try these. These sound delicious! Although I’ll probably leave out the sea salt as my husband’s not too crazy about that. I love the OXO utensils I have used, so I’d love to win some new ones! P.S. I also pinned this yummy recipe! I’m now following cookincanuck on twitter – such a fun name! Wow those cookies look phenomenal!! great giveaway!!! I agree – you had me at nutella! I shared this giveaway with all my facebookies! Those little mounds of nutella have me drooling. Beautiful photos in this post! Oh, and we missed you on Saturday, hope to see you sometime soon! I have just learned how fabulous Nutella is. How have I made it my whole life wo Nutella?? Hi Maressa, I really wish I could open the giveaway up to Canadians. Because I live in the U.S., I end up working primarily with U.S. companies. Unfortunately, many of these companies are bound by agreements that they have with distributors in other countries which stops them from being able to ship the products to winners outside of the U.S. I’m sorry! I have always wanted a cookie scoop! I followed OXO on twitter. I liked Cookin Canuck on fb. These cookies sound incredible! Thanks for allowing me to have three 🙂 I like that rule lol. Oh those cookies look crazy good! And Chocolate Nutella Fudge with Sea Salt ?! I think I’m in heaven. Nutella in my cupboard is a dangerous thing. I’ll eat it right out of the container with a spoon! These look so yummy! I now follow Cookin’ Canuck on twitter! 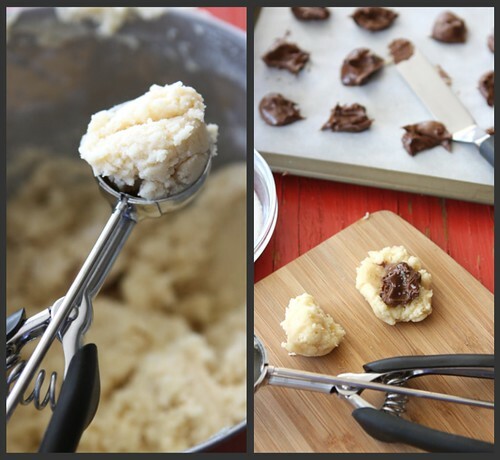 I tweeted “Head to @CookinCanuck for some Nutella Stuffed Cookies Sugar Cookies & an awesome @OXO baking giveaway. http://bit.ly/vcHDo4” from @bakebreakblog! I “liked’ Cookin’ Canuck on facebook too! Nice to have the long version of the recipe with photos, as well as a printable version. I’ve been wondering what else to do with the Nutella in my cabinet besides eat it out of the jar; this looks great. These look great, thanks for sharing. My grand babies are Nutella freaks…so guess I’ll have to give them a try!!! You can never go wrong, using ANY OXO products…I’m an OXO junkie!!! The “share” link to my Facebook post. I like Oxo on Facebook, too. Those cookies look great! Oxo is pretty darn great as well. what a great giveaway! and the cookies look great, even though I’m not a huge nutella fan. Looks like this is only open to US residents. That’s okay. Just here to say how great these cookies look. Nutella? Yes. Love this, Dara! These cookies look delicious! They are going on my list. Thanks for the opportunity! Those cookies look divine! I would love a chance to win your give-away! Thank you! Those cookies look really yummy!! I just love Nutella and will have to try these soon. I also am now following Cookin’ Canuck on Twitter. I’m a fan of OXO on Fb (as pão e queijo blog). I’m also a fan of Cookin’ Canuck on Fb (as pão e queijo blog). What a cute spatula! 🙂 I am a big fan of OXO products. Thanks for the chance to win some! I just tried to make your recipe and my cookies came out like soup…sure you didn’t mean to write: 1 1/2 cups flour instead of 1/2 cups??????????? Oh Molly, I am SO sorry that you had to waste your time and ingredients. Yes, it should actually read 2 1/2 cups and I have made the change to the recipe now. Again, I really apologize for the error. Oh, I so love Nutella!! I can’t wait to try these cookies! These, and you fudge recipe look fabulous – and I have 2 jars of homemade nuttella in the fridge! i follow Cookin’ Canuck on Twitter! and i “Like”Cookin’ Canuck on Facebook. I have been up to my elbows in cookie making and I love OXO! My kids and I love nutella. I love how simple this cookie looks even though I know it must taste extraordinary. I was just asking my wife what new cookies we should make for Christmas this year. This post answered for us! I made a promise I wouldn’t bake a lot of cookies this Christmas because this semester has not been too kind on my figure…but these cookies I’ve GOT to make. There’s always going to the gym after New Years! I love seeing those little spatulas everywhere this year! It’s amazing how much good a little spatula can do! I followed OXO on Twitter as well! I need all the baking help I can get! 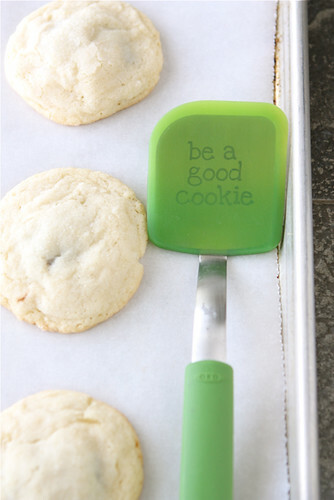 I love that Spatula “Be a good cookie!” Cute! Just in time for the holidays! The two best smells of Christmas are the tree and the cookies! I’d love to win this! Those look great! I may have to add these to my cookie list this year. I can’t wait to try these! Now that my kids are grown I might actually be able to purchase a jar of Nutella and have it last long enough to make something with it. This recipe cannot get any better! Can’t await to make these for Christmas! Another way to use nutella and sea salt . . . perfect! I follow Cookin Canuck on Facebook and love it! These cookies sound amazing! Look forward to baking these little gems! My kids love Nutella, so these sound great! You can never go wrong with Nutella! the Chocolate Nutella Fudge with Sea Salt sound delicious & i might have to try them for christmas! Love anything made with Nutella! Can’t wait to make these! These look AMAZING and I also want to make the fudge. Thanks, OXO, for alerting me to this website. If I had the patience to follow a recipe, I would so make these cookies. Freezing the nutella for a few minutes? Genius! Mmmmm…Nutella, number one food group! hockey & the cookin’ canuck, thank you canada ! I really appreciated the pictures along side the step-by-step instructions for the Nutella & Sea Salt Stuffed Sugar Cookie Recipe. I’m going to try this recipe for after Christmas dinner “yummies”. I can’t wait to fwd this recipe to my 12 year old friend who is a Nutella nut! He’s going to love all the goodies IF we win the prize…Love all my OXO utensils and these cookies for sure when I make them. Oh, I just love OXO products! Mmmmmmmm — I can’t wait to use all of these wonderful “gidgets and gadgets galore”!! Liked you on facebook and I am going to make some for my cookie tray that I bring in to work. I like oxo on facebook and in my kitchen! Awesome recipe! You had me at Nutella!!! I follow you on Twitter and Facebook. Keep up the great recipes!!!! I love Nutella, so these are definitely going on my ‘to bake’ list! you made me look! saw Nutella and OXO! I follow OXO on twitter as stonybuff. I follow you on twitter as stonybuff. I am so excited to see all the Nutella recipes! My daughters and I love the stuff 🙂 I really need some good cookie scoops, they are hard to find. Agggghhhh…nutella and sea salt….I’m drooling! A lovely happenstance, finding your blog. And what a wonderful giveaway. Sounds wonderful! Can’t wait to try the recipe, thanks so much!! i love that be a good cookie spatula it is cute as can be.. i could deffiantly use all this good stuff. Can’t wait to try these…!!! This sounds fabulous – the recipe and the giveaway. Thank you for the chance to win! Oh my goodness. I have seen SO many amazing recipes with Nutella lately, but I would never have thought to put it in the center of a cookie! Love love love this idea. I would love to win this set for my sister! She just moved out of our parents house and bought her first house, so this would be perfect for her. You had me at Nutella also. I am making these. We all love Nutella!!! I have never tasted Nutella before! Now I will definitely try this cookie. Thanks OXO. Look’s Super Yummy… Would love to win this package for my wife… She LOVES OXO. This is the first time I have been to Cookin Canuck and I am pleased to see all the recipes you have for Nutella. Also OXO are wonderful products too! Hi Tenesia, I really wish I could open the giveaway up to Canadians. Because I live in the U.S., I end up working primarily with U.S. companies. Unfortunately, many of these companies are bound by agreements that they have with distributors in other countries which stops them from being able to ship the products to winners outside of the U.S. I’m sorry! Love this…definitely going to try it for one of the holiday parties coming up! I’m following Cookin’Canuck on Twitter! I already like OXO on Facebook. yum. i will be making these on friday. thank you. Oh, how I need cookie scoops and storage containers and… What a great giveaway! And, I can’t wait to try all your Nutella recipes — I think the fudge is first! I love nutella and OXO products, I have arthritis in my hands and these are so helpful. I would love to win this. This recipe sounds super yummy. I can’t wait to try it out. These cookies look very tasty. They might have to get on my Christmas cookie list! I’m a Cookin Canuck FB fan. i LOVE oxo brand stuff. it’s just so expensive that i don’t have much of it 😉 those cookies look amazing!!! What a great giveaway. My kitchen timer is broken and I have cheap scoops that don’t work (and I’ve heard the OXO ones are the best). And Nutella–it is divine and the cookies look/sound great! I already like Cookin’ Canuck on Facebook. amazing cookies! I follow you on facebook! OXO – wow!! I love cookie scoops and would love new ones by suxh a fabulous company!! You just reminded me I haven’t made my famous Pecan Ball Cookies yet this year! I better get to it or Santa might be angry. I can’t wait to taste this cookie: I will be making it this weekend! Oh my goodness – these sound amazing!! I love Nutella, but don’t use it nearly often enough! I’ve been hooked on Nutella ever since I lived in Italy- these look delicious! I also follow Cookin Canuck on Twitter! I like Cookin’ Canuck on FB! I agree with comment from OXO that any opportunity to use Nutella in a recipe is great! i love your recipes! so good! Those cookies sound amazing and addicting! Oh goodness, you had me at nutella. I can’t wait to try these little beauties! I would love to have the OXO products in your give-away. Thanks for the chance to win. Dara, these cookies look fabulous! Sweet & salty gets me every time, especially if Nutella is involved! Thank you for sharing, and thank you for including my cupcakes in your post! Hi Dara. In a word “WOW”! These cookies look incredible. Despite the fact I’m in Canada, so can’t enter, but had to say “wow” and how much I love your blog. Have a great Thursday. Oh Dara, these look GORGEOUS! I miss you girl. I follow OXO on Twitter. I can’t wait to try these cookies. YUM! I follow you, Cookin’ Canuck on Twitter, and I am sure glad I do. Yummy stuff! It definitely took me 30 years to find out about Nutella. Now i’m going hard!! I “Like” OXO on Facebook…already had liked them, for a long time. Do you love to bake, but want new recipes? 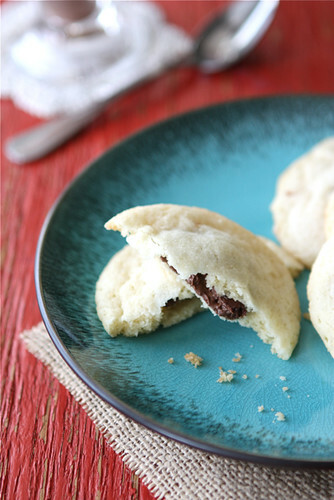 Check out Cookin’ Canuck & her Nutella & Sea Salt Stuffed Sugar Cookies. YUMMY! 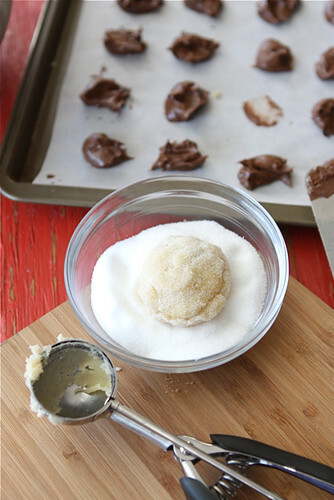 Here’s the link… https://www.cookincanuck.com/2011/12/nutella-sea-salt-stuffed-sugar-cookie-recipe-oxo-baking-giveaway/#comment-36180 Enjoy. I’m going to try this for my Christmas cookie plates. I hope that you and your family have a Merry Christmas! Great giveaway! I saw these cookies on Pinterest too. Yumm! I follow CookinCanuck on Twitter! I follow OXO on Fb. It’s so very cool how you made these cookies with the yummy middles. They look delicious! Beautifully done, excellent recipe, and so clearly explained and photographed – thank you & Happy Holidays ! these look great. i love nutella and am always looking for a way to use it in baking. so glad i found your blog. These cookies sound delish! Am heading to the store now for the Nutella and some eggnog! I am so making these cookies Saturday. Merry Christmas! What great items! Thanks for the opportunity! I now follow Cookin’ Canuck on Twitter. I now like Cookin’ Canuck on Facebook. The cookies look delicious! As do the OXO products! Those look amazingly good! I bet this recipe would work with peanut butter, too! I love that cookie spatula. I tweeted this blog post! QUESTION: do you use a convection oven? Do you have to rotate them if using convection baking? I love OXO products! They make baking fun! MMM! I can’t wait to make these cookies. I just bought a jar of Nutella for the first time. I think this will be the first recipe I make with it! I like Cookin’ Canuck of FB!! I like OXO on FB!!!! My fav OXO is the silicone scoop with the black handle (#1067686) – I keep it in the freezer ice bin – no more frozen fingers! I’ve never made stuffed sugar cookies before – sounds delicious! I’d love to win this baking set! I “like” Cookin’ Canuck on Facebook. Uh, how did I miss this last week? Nutella? Sea salt? Sugar cookie? You gone and out done your self lady. Seriously. So glad I just followed you on twitter – these cookies look amazing! This fudge sounds and looks amazing!!! Thanks for sharing! these juuuust came out of the oven & ohhhh my… they’re amazing! thanks so much! I missed the deadline but my comment is – I think I am going to start a new Pinterest board JUST for Nutella recipes. Will definitely add yours to it. Thanks for sharing. What a wonderful giveaway. The cookies look great! Yum!!! Unique & delicious. Found you via Bake at 350 — thank you for posting! Oh, I can’t wait to try these! And that giveaway is fabulous (fingers crossed)! HI! I tried this recipe this evening and the cookies spread flat and thin. They still tasted delicious but what did I do wrong? Oy! I figured it out. I used 1 3/4 cups of butter instead of 14 tbsp…eeek!!! Now you must ask…was it too much butter, yes probably but it was still delish! Haha. Stick your jar of nutella in the freezer for an hour and use a melon baller to make the core of your cookies 🙂 less mess! These cookies are fantastic! Made them for Valentines Day with pink and red sugar!! SUPER cute and yummy!!! Madison, what a fun idea! I’m really glad you enjoyed the cookies. I made these cookies this morning and they’re SO good! The only change I made was to use Biscoff Spread instead of Nutella. Thanks so much for the recipe! By the way, I have that pretty green “Good Cookie” spatula and I just love it. I just made these cookies and my dough was way too SICKY and i couldn’t split it in half to put the nutella in. I have tripled checked the recipe and I have done everything precisely as stated. What could have went wrong? Mehrnaz, I have to be honest that I have no idea what went wrong. I haven’t had that issue, nor has anyone else reported having this issue. The dough is a pretty standard sugar cookie recipe and shouldn’t produce those results. The only thing I can think of is that you may have added too much or too little of one of the ingredients. I had leftover Hazelnut Chocolate Spread to use up that I’d bought for a special-crepe-making occasion; it’s not an item I normally buy, and it’s far too expensive to waste! I happened upon your website and decided to give this recipe a whirl . . . yowza! A satisfying sweet fix, to be sure — I’ll place it on my “bake occasionally” list as they’re a little too divine. This is such a great idea- coming from a girl who would scoop tablespoons of nutella before going to bed, it only makes sense that this should be baked really really soon in my kitchen. Thank you!! Thank you for this recipe. Sounds wonderful! I cannot seem to find at what temperature to bake these at. Could you let me know. Thanks!!! I’ve made these cookies SEVERAL times, they always turn out fabulous and are gobbled right up! I made them over the summer for a 4th of July party and rolled some in red sugar, some in blue sugar and some in regular white sugar and then lined them up on a platter – very cute and soooo yummy! What a fun idea, Arael! I’m so glad you enjoy the cookies. It is sea salt right? Because it looks like Kosher salt in the picture. This was a great way to make a simple sugar cookie that much more divine!! Nutella makes everything better. I have made it many times and each time I come back with great reviews. It is a simple cookie and I am pretty sure this is one of my favourite cookies for 2013. Love your step-by-step instructions and pictures. I just wanted to say thank you. This is the best cookie recipe I have in my rotation. I have used it so many times. It is a favorite of myself, my husband and all of our kids. They never last long when they’re made, whether we just keep them at home or take them to a get together!